WordPress can do much more than just host your blog. With a little tweaking, it can be turned into a full-on content management system (CMS), complete with online shopping and e-commerce solutions. Most of this can be accomplished using simple plug-ins that do all the heavy lifting. Your job is to install the right software, customize it to your liking, then sit back and let WordPress do its thing. When turning your site into an e-commerce destination, there are a few popular plug-ins that inevitably cross your path. Some solutions are better than others, of course, which is why we’re taking a look at the best WordPress e-commerce plugins for your online store. It’s more than just WooCommerce vs Shopify, you know! Front-End Responses: noticing too many redirects? If the number of redirects is higher or close to the number of successful hits, it means that there is a problem with your site. There’s no one-size-fits-all solution for e-commerce store plugins. Every business needs something slightly different, turning one site’s must-have feature into another’s pointless extra. The best part about WordPress e-commerce plugins is the market is both wide and deep. Competition is fierce between store solutions, which means end-users can almost always find the perfect fit for their shop. Before embarking on your quest for a good e-commerce plugin, ask yourself the following questions to narrow down the search. Physical vs digital goods – Some plugins are designed only for digital products (e-books, photos, videos), while others focus on physical products. If your site focuses on the latter, you’ll need a powerful plugin solution that helps you deal with shipping, taxes, etc. Payment gateway support – Customers need seamless payments integration, otherwise they won’t bother with your products. Make sure your plugin supports the most common gateways like Stripe and Paypal. Cryptocurrencies are a fast-growing sector of online payments, as well, and you might want to consider accepting those from your customer base. Themes – Nearly all e-commerce plugins have one thing in common: they’re as bland as a bowl of broth. Theming your store invites customers to come in and shop, but if your solution doesn’t play well with most WordPress themes, you could be looking at an expensive redesign. Check our list of Best WordPress Themes brilliantly mixing style and functionality. Extensibility – No e-commerce plugin will support everything you need right out of the box. The best solutions add extensibility in the form of their own plugins, all designed to give you the features you need with a minimal amount of fuss. Price – Many e-commerce plugins are free to use, but they carry a per-transaction surcharge. Others offer subscription plans or one-time purchase prices. Plugin support – Even the best-designed plugins aren’t 100% foolproof. Make sure you’ll have decent access to support documents or a support team in case something goes wrong. 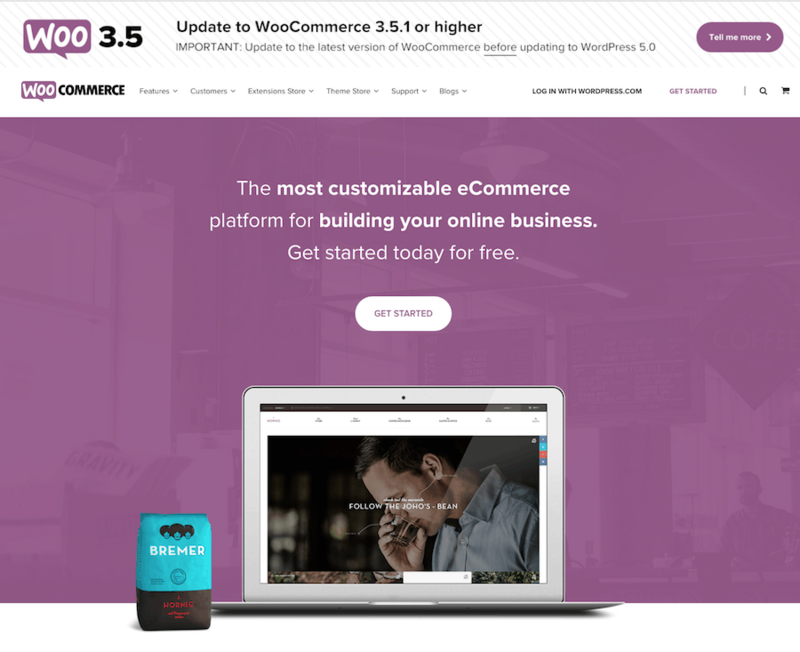 Arguably the most popular e-commerce solution in the WordPress space, WooCommerce has made a name for itself as an inexpensive and highly extensible solution for setting up an online store. It’s a great go-to if you’re not sure what you need from a plugin. For starters, WooCommerce supports both digital and physical goods. It’s surprisingly easy to sell both products side by side, as well. The plugin handles taxes and shipping details automatically and can even deliver download links to digital-only customers the moment they purchase. WooCommerce offers a full inventory management solution alongside its storefront options, as well as a wide variety of payment gateways and support for affiliate and external products. There’s plenty of documentation for WooCommerce, as well, just in case you run into any issues. There are also hundreds of themes and add-ons that support WooCommerce. It’s incredibly easy to add new payment gateways, style your store to suit your brand, or add new features that make shopping easier on visitors. The downside to using WooCommerce is that sometimes it’s a little too complicated. A lot of this has to do with the plethora of add-ons available for the plugin, many of which perform similar functions in a different way. How are you supposed to find the best one for the job? Trial and error, unfortunately, which can be frustrating. Another downside to the WooCommerce experience is speed. The plugin is notoriously slow on certain devices and with certain web hosts, prompting third parties to release separate extensions that work to speed things up. Not everyone runs into this speed issue, but if you do, it can be a store killer. You can use Pingdom to monitor your site’s speed and look for performance issues. At the end of the day, WooCommerce still stands tall as one of the best e-commerce plugins for any online store. It has a wide user base with a massive variety of add-ons and themes, meaning just about everyone is guaranteed to find what they need to get their shop up and running. And best of all, it’s entirely free. Another powerhouse in the online shopping market space is Shopify, an e-commerce platform that works with WordPress via the WP Shopify plugin. Shopify has a huge customer base and offers a large variety of features that are extremely easy to set up. It’s another great resource for beginners, but it also has the ability to satisfy power users, as well. Shopify includes a full inventory management suite that lets you import, edit, track, and analyze every transaction on your store. This is perfect for both digital and physical goods, both of which Shopify handles with ease. Shopify also has the ability to accept credit cards along with payment gateway support for all the big players, including Paypal and Stripe. The plugin integrates with everything from the Facebook Store to purchasable pins on Pinterest, too, which makes it super easy to extend your shop beyond the confines of a single web page. Linking Shopify to WordPress is easy through WP Shopify. The plugin essentially syncs Shopify to the WordPress installation, allowing you to seamlessly manage your online store without giving up features from either platform. It’s fully customizable, SEO optimized, and as straightforward to use as any other WordPress plugin. One slight downside to using Shopify is that it isn’t free. The service carries a monthly fee to use the platform, which takes care of all the hosting and traffic charges in one swoop. WP Shopify carries a yearly subscription price if you want the full range of features. Shopify also takes a cut out of certain transactions, as well, encouraging users to go with Shopify Payments to avoid added fees. WP Shopify is an incredible e-commerce plugin that can serve just about anyone’s needs in an instant. It’s fast, easy to use, and comes with plenty of extras, all designed to make your store a success. Another big player in the e-commerce plugins department is Easy Digital Downloads. 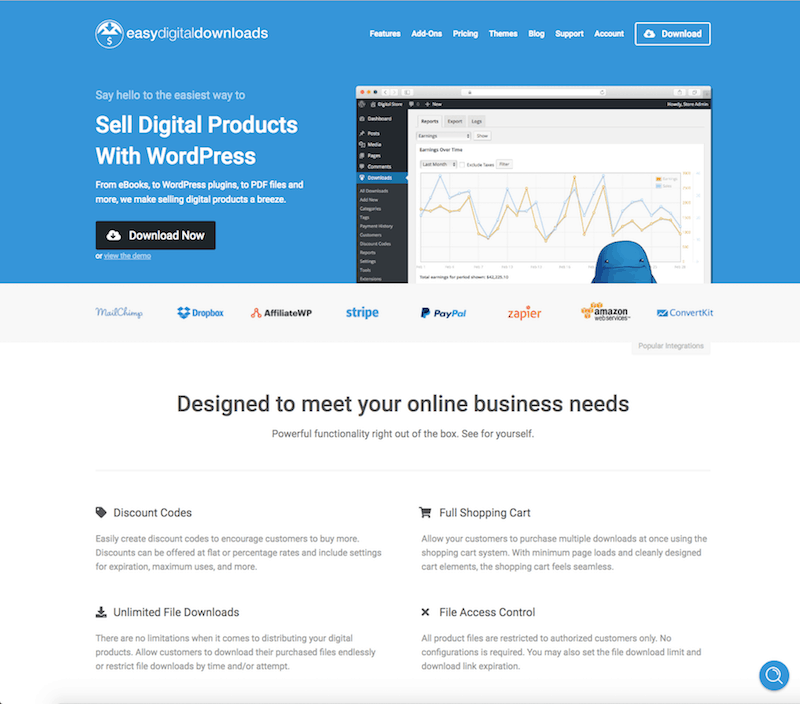 True to its name, this WordPress extension focuses on making selling digital goods as painless as possible. Ease of use is by far the plugin’s most praiseworthy feature, which makes it a good choice for beginners setting up their first online store. Easy Digital Downloads offers an extensions store that provides hundreds of options for adding payment gateways, platforms, and additional services. 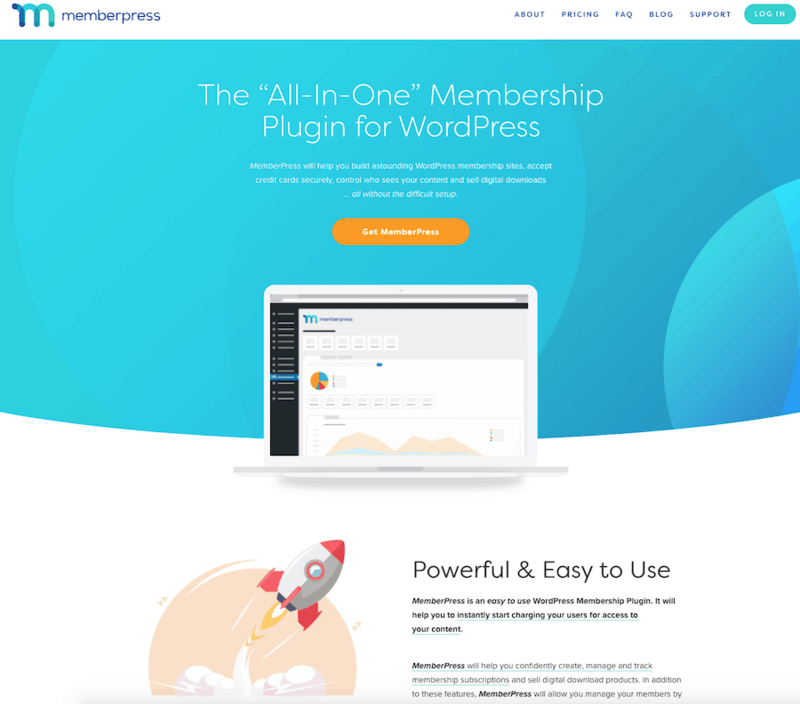 It also works with just about every WordPress theme out there, including exclusive themes offered by the plugin team themselves. Easy Digital Downloads also goes out of its way to deliver incredible support, both in the form of tutorial documentation and live customer service. IRC chatrooms and forums are also available in case you need more interactive assistance. The downsides to Easy Digital Downloads are few and far between. As mentioned above, the plugin is limited to digital products only, meaning no physical goods and no support for shipping. You also can’t sell external or affiliate products using this service, which can be too limiting for some power users. Simplicity is at the core of what Easy Digital Downloads does. The plugin does one thing and it does it well, so if all you need is a quick and easy way to sell digital products, this might be the plugin for you. 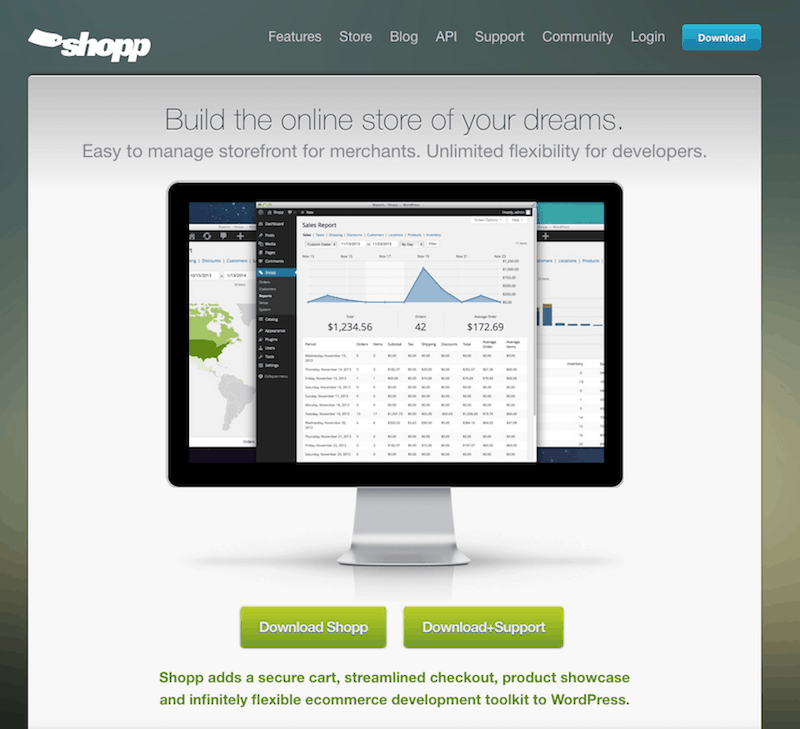 Shopp is a flexible WordPress plugin that lets anyone build and manage their own web-based storefront. The interface offers all the basics right up front, allowing users to create product pages, manage shopping carts and inventory, and even work with promo codes or coupons, all from a convenient point and click interface. Shopp has all the basics you need to start selling products. It works with both digital and physical goods in tandem, allows for detailed product pages that include variants, and handles SEO content to help keep your page at the top of Google’s results page. The support documentation for the plugin is also spectacular, so if you run into any trouble, Shopp is here to help. Shopp has some nice hidden features that make it run a little more smoothly than its competitors. For starters, it stores its data in separate tables in the database, allowing products and pages to load much faster than, say, WooCommerce. This means your store can grow to an impressive size without impacting page performance. The downsides to Shopp are largely cosmetic in nature. Because the plugin doesn’t have as big of an audience as WooCommerce or Shopify, there’s not as much demand for unique themes or added features. Some users may find Shopp’s offerings a little bare-bones for their tastes, especially when it comes to design elements. Online stores are more than just single transactions for digital and physical goods. Selling memberships, pay per view content, and subscriptions is another source of income for a variety of businesses. MemberPress is one of the best ways to manage these purchases without pulling your hair out. Let’s start with the limitations inherent in MemberPress. The plugin is built around subscription-based products and services, so you won’t be able to use it for one-off purchases for physical or digital content. The service also keeps payment gateways limited to Stripe, authorize.net, and Paypal, which cuts out a lot of potentially lucrative alternatives. On the plus side, MemberPass really is one of the best ways to sell subscription-based products. Anyone can get a store set up and running in a matter of minutes, creating everything from members-only content to pay per view articles and videos, all safely gated behind powerful access rules enforced by MemberPress itself. Simplicity is key with MemberPress, which is why the plugin focuses on such a narrow band of services. If this fits your needs, however, it’s the perfect solution. Now that you’ve got all the information, how do you decide which e-commerce WordPress plugin is best for your store? If one didn’t immediately jump out at you as number one, use the guide below for a quick final summary. WooCommerce – Best all-around shop plugin with the best price (free), the most themes, and the most features. Can be overwhelmingly complex for beginners. Easy Digital Downloads – One of the fastest and easiest to use plugins to get a digital goods store up and running. Doesn’t support physical products. Shopp – One of the less-popular plugins that’s easy to use and surprisingly fast. Doesn’t offer a lot of features or themes, however. MemberPress – The best way to sell pay per view content, memberships, and subscription services. Doesn’t do much apart from that. Choosing the right e-commerce plugin for your store is a difficult process. There are so many features to consider and a lot of details to research, many of which are so well-hidden you don’t even consider them until it’s too late. Fortunately, most of the solutions on the market go to great lengths to provide enough tools so that just about anyone can get their store up and running in a matter of minutes.